The famed cherry blossoms in Washington, D.C., have reached peak bloom, enveloping the edges of the Tidal Basin with a canopy of delicate light pink to white flowers. The National Park Service announced Monday that more than 70 percent of the Yoshino cherry tree blossoms are open. Cherry blossoms typically reach peak bloom during the last week of March or first week of April and draw up to 1.5 million tourists to the District every year. Crowds of blossom fans descended on the Tidal Basin to enjoy the blossoms, even amid chilly and windy weather. How long will the bloom period last? The NPS says you can get a gorgeous view for the next 7-10 days, depending on temperature and wind. 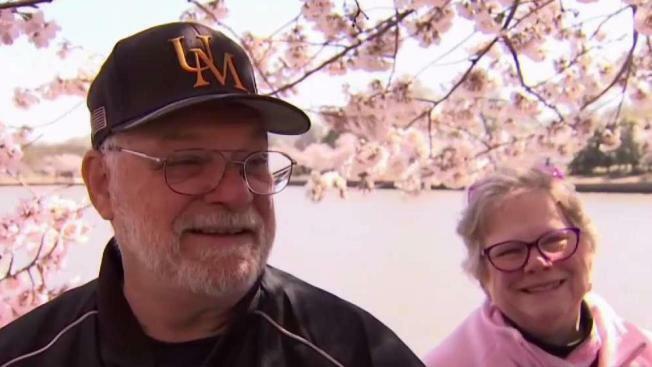 Cool, calm weather can make a tree's blooming period last longer, but a blast of wind and rain could bring a quick end to the blossoms, the National Park Service says. Here's the peak bloom forecast.